We have planted shoepeg corn this year. 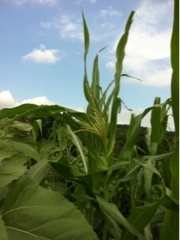 With a tighter twist at the top of the tassel, it is harder for the dreaded corn ear worm to get in there. 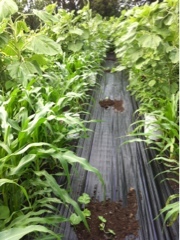 Since we use no chemicals it is a true battle on sweet corn to actually produce something edible. Has not happened yet, and we grow every year. There has been more than one planting. 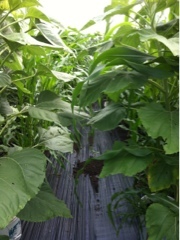 A grower from Detroit visited, and planted these that are now waist high. Earlier, we had planted, and that corn is already overhead. And interspersed with sunflowers too. Today we noticed tassels. After tassels arrive ears of corn. If the wind is right and cross pollination occurs. No pollinators are needed with corn, the pollen just blows around. We can go out and hand pollinate when more tassels appear: that used to be a thing people did before GMO corn came into being. Homer is close to 6' tall, and had to look up to take this. Seven feet tall? Now we have to be careful and keep the cattle away from this part of the farm. They are corn lovers too, and will break down electric fence to get to it. Best if they don't get too close, and if multiple strands of wire are electrified between them and this crop!